Bulgaria,and especially the South West of Bulgaria is a dream destination for lovers of hiking or simply lovers of beautiful walks in the nature. In this region you can for half a day,one day,two days,benefit from a large number of marked trails for all ages and sports levels! Once in GARMEN HILLS we will guide you with pleasure to these routes.For example,we specify here some representative routes among our favorites and illustrated by pictures. It is a walk that starts after Gorno Dryanovo and allows to reach the Kanina River for a swim and a picnic in spring/summer. It is a walk of less than an hour to go down to the river (to go up? ),to bathe and maybe jump from the top of the blue fall! Called "Sinia Vir" this trail begins a few kilometres after Kovachevitsa if you have dared to take your car up there..
You will walk through a forest of pines and birchs and undertake a bucolic path although the descent is fairly steep at times to get to the river. It offers magnificent views of surrounding hills and allows you to explore many different vegetation types.Like many trails in Bulgaria,it has points of rest and refuges. From the city of Dobrinichte you will reach the bottom of the ski slopes of this small ski resort and take the chairlift which will take you to the first hut,located on the edge of the Lake. Within the mountains of RILA is one of the most beautiful walks to do in Bulgaria,since you can admire a circus of seven original mountain lakes,nestling up to an altitude of 2550 meters. 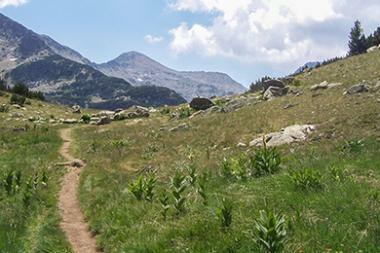 This hike is a must for lovers of nature and mountain.